Welcome to the Acme Sponge Company website. Acme is a manufacturer and wholesaler of natural sea sponges and synthetic sponges for use in spa, bathing, general cleaning, painting, automotive, hobby, trade use and much more. On our website you will find information about our products, their uses and about our company. In addition, you will find information on retailers and where to purchase our products. At Acme, we pride ourselves on offering our customers real value in the form of long lasting high quality sponge products that help get the job done right the first time. We offer the finest products from the finest materials in the world, and we stand behind them. Please refer to our Catalog for information on specific sponge and chamois products, the Products section for additional information about sponge and chamois products and their uses, or the Brands section for information on what makes our brands better. Information about our company and its history can be found in the About Us section and we can be contacted directly through the Contact Us page. Or to purchase our products, the Retailers page provides links to our many fine retailers both on and off line. Synthetic sponges are sponges that are made through a combination of chemical process, as opposed to natural sponges that are simply harvested and processed. Because different types of sponges work better for different applications, Acme offers two different types of synthetic sponge lines in addition to our natural sea sponges. Our Duro-Cel™ line contains different sizes, shapes and formulations of polyester sponges and our Aqua Sponge™ sponges are made from cellulose. Synthetic sponges that are made from polyester foam are very durable, elastic, light, economical and more chemically resistant than other types of sponges. Polyester sponge products are extremely soft, wet or dry, and have a super-absorbent honeycomb structure that make them an ideal choice for masonry, drywall, wallpapering and wall washing. The same properties that make them ideal for these types of applications also make them a good choice for all general home, auto and marine cleaning. Cellulose synthetic sponges, which are some of the most common types of kitchen and cleaning sponges, are exceptionally versatile and available in a variety of colors and shapes. Cellulose sponges are popular because they are extremely absorbent, soft, durable and inexpensive. Cellulose sponge products work well on many different types of surfaces, are great at absorbing and holding onto liquid, and can be sterilized with heat (boiling or microwaving) or an antibacterial soap. Made from a form of wood pulp, cellulose sponges are not only versatile and durable, but also completely biodegradable. Because they are made from wood pulp, a sustainably harvested material, they are also environmentally friendly. Cellulose synthetic sponges are great for everyday kitchen, bathroom and other household cleaning, as well as for home, construction and specialty manufacturing applications. Our synthetic sponge products have been developed for many different types of applications that synthetic sponges work best for. We recognize that having the right tool, or sponge, for the job saves time, money and effort, and have developed our Duro-Cel and Aqua brand sponges toward that end. Our Duro-Cel brand sponges are popular with professional tradesman as well as household users. 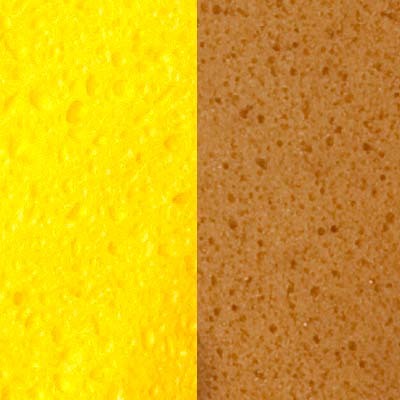 Our broad selection of sponges can be used for many different types of applications, including masonry floating, drywall finishing, painting, cleanup, etc… Duro-Cel sponges are also used for general purpose cleaning projects including auto, flooring, tile, kitchen, walls and painted surfaces. Duro-Cel cellulose sponges have a structure that gives them exceptional capillary action for maximum absorption and a durability that makes them useful through multiple projects. Duro-Cel, quality cellulose sponges for quality results. What are Duro-Cel Brand Cellulose Sponges? Our Duro-Cel cellulose sponges, like all cellulose sponges, are made from a form of wood pulp. The most common types of cleaning sponges on the market, cellulose sponges are extremely versatile and are sold in a variety of shapes and colors. Cellulose sponges are not only durable, but also completely biodegradable. Cellulose sponges are extremely absorbent, soft, durable and inexpensive. Cellulose sponges work well for everyday spills on kitchen and bathroom countertops, for general cleaning, washing dishes and for a variety of home projects. Although cellulose sponges can be sterilized with heat or an antibacterial soap, cellulose sponges should not be used to wipe up raw egg or meat juices, as bacterial growth can occur. Larger cellulose sponges are easily cut into smaller pieces for smaller or specialized jobs. How are Duro-Cel Brand Cellulose Sponge Made? Cellulose sponges are typically made from a mixture of wood pulp (cellulose), sodium sulphate crystals, fibers and softeners (materials, such as flax, are often added to provide additional strength or chemical resistance). The process of manufacturing cellulose sponges begins with large stiff sheets of cellulose that are then soaked in a vat of water and mixed with softeners. Once the sheets have been softened and become “jelly-like”, they are moved to a revolving mixer where sodium sulphate crystals and dye are added. After the ingredients have been thoroughly mixed, they are poured into a mold and heated. As the mixture is “cooked”, the sodium sulphate crystals melt and drain out through the bottom of the mold. The voids left behind by the the crystals create the pores in the finished sponge. The size of the crystals determine the size of the pores. Cellulose sponges with larger pores, such as those used for washing a car or truck, are made with larger crystals. Finer pore sponges, such as those used for applying makeup, are made with much finer crystals. The cellulose mixture hardens into a porous block as it cools and is finally cleaned and colored before being dried and cut into the appropriate sizes for packaging. 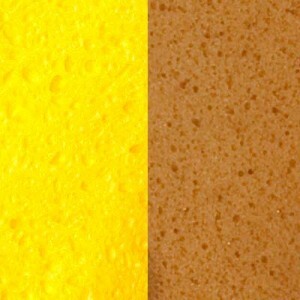 Our genuine sponge products are available from Acme sponge retailers. Click on the logo of the retailer you prefer to see their selection of Acme products online or to find a retail store near you.